Add classic looks and timeless beauty to your home with Strand Woven Natural Solid Bamboo Flooring. Featured in a tongue and groove design with a stylish finish, this flooring features a janka rating of 4000, more than three and a half times harder than Red Oak. The durable 11- layer polyurethane/aluminum oxide finish offers a high scratch resistance while maintaining a beautiful appearance. The higher stability and unique construction of Strand Woven Bamboo allows for glue down or Elastilon installation over multiple subfloors on or above grade. Whether installing over concrete or plywood/OSB, this flooring has you covered. 23.29 sq. ft. per case and case weight: 57.86 lbs. 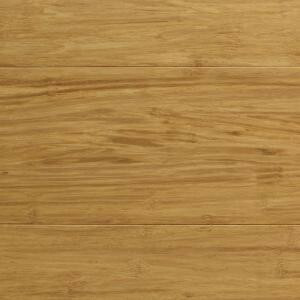 Buy online Home Decorators Collection Strand Woven Natural Bamboo 1/2 in. Thick x 5-1/8 in. Wide x 72 in. Length Solid Bamboo Flooring (23.29 sq. ft. / case) HD13002C, leave review and share Your friends.